There are many different ways to store your chemicals. Smaller containers are great for smaller quantities, but certain chemicals or fuels are able to be stored in drums. Drum storage is a great way to store your bulk chemicals, and with U.S. Chemical Storage, achieving compliance is a simple process. Making your facility a safe place for personnel and visitors alike, proper drum storage can lessen the hazards associated with your chemicals while preventing leaks and spills from escaping your storage unit. Compliant drum storage starts with safety. There are steps you can take to ensure your storage area is protected, but the most important part is the storage building’s construction. A proper chemical storage building is built specific to the chemical to be stored, to ensure that the required environmental conditions are met to maintain your chemical drums. Aditionally, your drum storage building should be clear of obstructions to allow for safe and easy loading and offloading of materials. Storing drums within an approved facility can help you attain compliance while addressing certain hazards such as corrosive or oxidizing properties. Our goal is to help you store chemical drums in a way that satisfies government regulations for years to come. By storing chemical drums within our DRUMLoc storage unit, you’re utilizing a Factory Mutual Approved product that’s guaranteed by our 15-year Structural Warranty. Our secondary containment is leak-proof, factory-tested for even a pinhole leak, and our construction is chemical-, weather-, and UV-resistant because of our 2-part coating inside and out. Additionally, equipping your storage building with any of our optional accessories can further facilitate the storage process and help you maintain your chemical inventory, allowing for easy loading and unloading of drums, so your personnel remain protected. 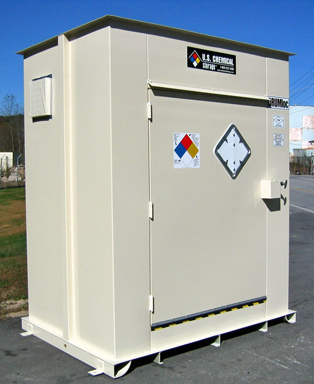 Your drum storage building will be built to satisfy EPA, NFPA, and OSHA regulations, helping you remain safe and compliant. Plus, it’s fully customizable, so you know you’re getting a quality product that adheres to regulations and protects your chemical drums.